Have questions about drugs? Come have "Java with the J-Team" on Wednesday, April 18th from 5:30-7:30 PM. Join us for Santa Clarita Valley Sheriff’s Station very first “Java with the J-Team” event on Wednesday, April 18th, from 5:30 P.M. – 7:30 P.M. The event will be held at Starbucks, 26480 Bouquet Canyon Road, Santa Clarita. Santa Clarita Valley Sheriff’s J-Team (Juvenile Intervention Team) works to break the cycle of drug abuse, which involves much more than traditional law enforcement. The team’s outreach is not limited to strictly juvenile narcotic offenders, but help is also extended to young adults who are struggling with drug addiction. J-Team detectives follow-up with young adults who have been arrested on narcotic charges, with the mission of offering help and resources to them and their family members, aiding in the fight against addiction. The J-Team works to raise awareness about the proliferation of drug use and abuse in Santa Clarita. 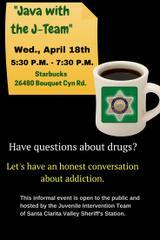 The deputies share information that will help identify and address potential drug problems. In many cases, family members need education about the warning signs of drug use, information about what to look for and what substances their children might encounter, and information about what to do and where to turn if they have cause for alarm.